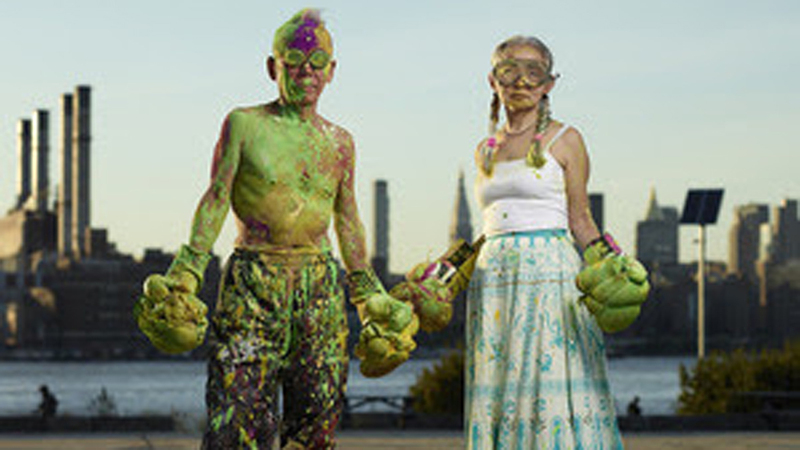 In 2013 director/cinematographer Zachary Heinzerling released his debut feature, Cutie and the Boxer, the story of Japanese artist Ushio Shinohara and his embattled wife, Noriko. After screening in New York and select cities in August of that year, the film was nominated for an Academy Award for Best Documentary Feature. Cutie and the Boxer has its national broadcast premiere on Friday, September 18, at 10:00 p.m. as a special presentation on PBS’s POV (Point of View). (Check local listings.) American television’s longest-running independent documentary series, POV is the recipient of a 2013 MacArthur Foundation Award for Creative and Effective Institutions. Below please enjoy our review, which was originally published on JapanCulture•NYC on August 8, 2013. When Zachary Heinzerling first met Ushio Shinohara, the young filmmaker had no idea the old artist known as “Gyu-chan” was a vital cog in Japan’s post-World War II avant-garde art machine. Nor did he care. It wasn’t Ushio’s resume – founder of Neo-Dadaism Organizers in Japan, purveyor of “junk art,” innovative “boxing painter” – but his dynamic, spunky personality that sparked an interest and set Heinzerling on a five-year journey to create a film that would be a unique twist on the standard artist documentary. Heinzerling also had no idea that it would be Ushio’s long-suffering wife, Noriko, who would end up driving the narrative. The Shinoharas personify “starving artists,” as they live minimally, often in danger of being evicted or of having their utilities disconnected. The bigger worry is the couple’s son, Alex, who is clearly uncomfortable – either on camera or in his parents’ presence – and makes only a few brief and practically silent appearances, mainly to establish his alcoholism. In the film Noriko acknowledges that throughout his childhood Alex was “surrounded by a bunch of drunks,” including his own father. Although Ushio says that riding the subway may be embarrassing for him after the release of Cutie and the Boxer “because all of my privacy will be revealed in this film,” he and Noriko are no strangers to the camera. Along with glimpses of the Shinoharas’ current life, Heinzerling sprinkles in old home videos made by friends and archival footage from Japanese production companies. “We artists are exhibitionists all the time,” says Noriko. Yet it was Noriko who took time to warm up to Heinzerling and the idea of the project. 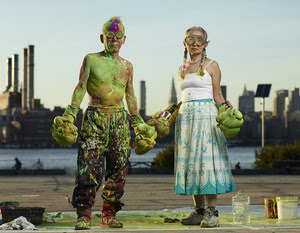 It wasn’t until Noriko realized that Heinzerling wasn’t making strictly a documentary about Ushio’s art that she felt more comfortable having him in their cluttered Brooklyn apartment. Noriko also noticed that Heinzerling shifted his focus slightly to her and her artwork. Noriko started finding her voice through cartoon-like sketches in a series she calls “Cutie and Bullie,” Cutie being Noriko’s persona, complete with pigtails, and Bullie representing her husband. Through animated sequences of Noriko’s art, Heinzerling gives viewers the Shinoharas’ painful backstory. Noriko arrived in New York at age 19 to study art, but that dream was squashed after she met Ushio, 21 years her senior, and soon became pregnant with Alex. “Cutie and Bullie” is Noriko’s catharsis, as 40 years of Ushio’s alcohol abuse and their constant struggles to keep above the poverty line spill forth onto her canvas. The Shinoharas say they are happy with Cutie and the Boxer. Well, with maybe an exception or two. “Sitting in the theater, to see myself after the film was made, it was kind of ‘Wow, I’m so miserable,’” says Noriko. That back-and-forth from the Shinoharas’ four decades together provides a compelling source of energy for an artist documentary that isn’t really an artist documentary. There is an air of sadness throughout Cutie and the Boxer, and it serves as an examination of relationships, making us think of the sacrifices we all make for a person or a situation. It’s more intimate than one might imagine, with extreme close-ups, some uncomfortable dialogue, and Noriko’s honest storytelling. Viewers will also think about artists as everyday people, trying to make a living like the rest of us. “The essential question in the film is, ‘Is it worth it?’” says Heinzerling. Noriko chose “the pain of being in a relationship with an egotistical drunk” over her art, while Ushio is constantly poor and disappointed with how his art is received in New York. Ultimately, the Shinoharas give us hope. The realities of life often get in the way of the plans we make, but we’re never too old to follow our dreams. Cutie and the Boxer streams online Saturday, September 19 through Sunday, October 18.